Vinyasa Flow is a dynamic form of yoga, where the sequence of postures (asanas) is synchronized with the rhythm of the breath. Asanas ‘flow’ from one into the other, connected with your breath. This Vinyasa Flow brings you a dynamic work-out as well as a clear and relaxed mind. The Vinyasa Flow classes start with a centering meditation to ground yourself, create awareness and quiet your mind. After the meditation and sometimes a gentle warm-up you will move into a series of Sun Salutations A and B with some variations and modifications based on class level, preparing the body and mind for the main sequence of challenging asanas. Integrating some asanas with a deeper stretch in the end, the Vinyasa Flow will be concluded with a well-deserved shavasana. Overall, the Vinyasa Flow class is challenging, but always adapted to the needs and experiences of the attending yogis. The dynamic and stimulating work-out helps you to develop endurance and resilience. Due to its more physically demanding nature, expect to break into a sweat, which will expel toxins and re-energize the body. 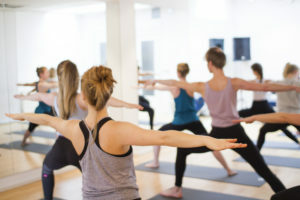 The Vinyasa Flow class targets the whole body: building strength in the core, legs and upper body, creating flexibility and enhancing posture and alignment. Synchronizing breath with the movements will create a focused and meditative practice and bring clarity to the mind. Prepare to sweat and receive a good cardio work-out!